There was a lot of excitement on the Paris runways this year. It was a riot of color, texture and innovation. For me, the most fun thing about the various Fashion Weeks is to try to determine which ideas will turn into trends that can segue onto the streets. Here are a few of my favorite Paris ensembles representing ideas I think we can extrapolate into our own wardrobes. Above, a mini dress by Isabel Marant, one of my favorite designers. I think we’re going to see a lot of prints that have a sort of trompe l’oeil vibe, such as this Marant feather print. While spring/summer prints are a lot of watercolor florals and painterly approaches, for fall/winter the palette and subjects may change, but prints will predominate. 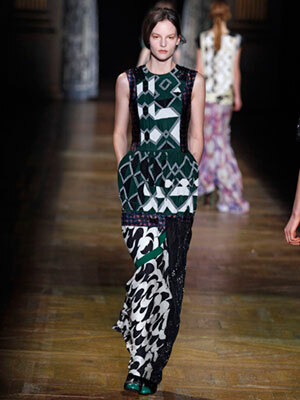 Love this Gotham-inspired print by Dries van Noten. The shape is stunningly architectural and the splash of jewel tones in the collage bits is so fresh. And how about those emerald shoes! I think we have another season of colorful shoes ahead for us. Will we be seeing more evening gowns with pockets? It’s a practical idea but will it fly? We are seeing this gorgeous, almost electric navy or midnight blue in Armani this spring. Now it’s reappearing for fall and winter. Hooray! It’s so much more alive than black and it’s a really flattering color for a lot of women. Designer Haider Ackermann solves two perennial problems in this one gown: first, the fact that we often freeze in ice cold ballrooms during gala events, second many women (of all ages, but mainly over 40) do not like to bare their arms, even in an evening gown. So I’m seeing this idea of the jacket over the gown becoming de rigeur among designers. I’ll bet we’re going to see it knocked off at all price points. The signature Hermes orange got kicked up a notch with this vibrant suit. Pairing it with a long, long gold chain and gold shoes takes it right into the evening. You know those silk Chinese pajamas or ao dai-inspired pants and tops that have languished in your closet for a few years? Maybe it’s time to get them out again and gussy them up with a single long necklace and some shiny metallic shoes. It’s very Hermes, you know. I have to hope this fabulous ’40s hair and makeup are going to be huge. I adore the whole aesthetic of the ’40s and its capable and captivating women. Dior (whose designer we do not have to mention) showed us how to layer suede on suede in gorgeous saturated colors, taking ruby and lapis out of our jewels and onto our clothes. I’m thinking these more electric jewel tones will take off. Since trenches are starting to be seen with double-breasted looks, can blazers be far behind? Of course Chanel’s Karl Lagerfeld is the ultimate trend setter and here he presents a couple of really original ideas that will probably go viral and be copied in a thousand different ways. First, it’s two coats in one, combining the classic Chanel tweed jacket with a 3/4 length wool coat. Next, it’s the slouchy socks over the skinny jeans, kinda like the leg warmers we all wore (yes, even here in Hawaii in hot dance studios) back in the ’80s. I’ll bet designers come up with some versions that are not quite as, well, warm, this time around. With all the fabric innovations there must be an answer. One of the things we learn from the shows in New York, London, Paris and Milan is news of the latest – and greatest – in fabrics. As designers experiment with new mills and new ways of combining and treating fabrics (and even metals), we can see new possibilities unfold. For example, suede used to be fairly thick and stiff and would never have layered the way Dior layers his suit today. The world’s knock-off designers and retailers can never duplicate those fabrics while maintaining their cost cutting measures, but we can always hope that, by checking out what’s new and beautiful in the realms of high quality clothing and especially couture, we can educate ourselves to know the difference between quality (and lack thereof) and become more savvy consumers. This entry was posted in International fashion and tagged Chanel, Dior, Dries van Noten, Hermes, Isabel Marant. Bookmark the permalink.